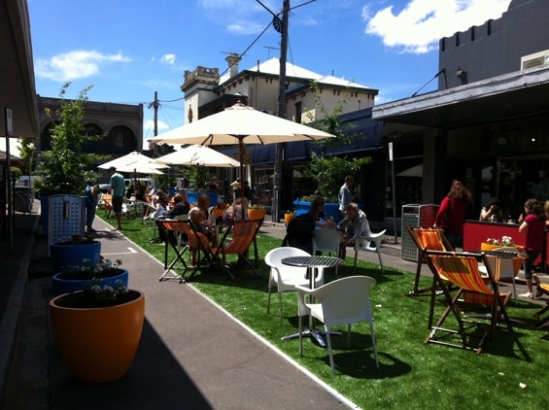 Part of bustling Ballarat St in Yarraville, Australia (a suburb of Melbourne) has been transformed into a “pop-up” park for a short term project which is introducing more open space into the Yarraville Village. The pop-up park is one of a few installed in Australia on a public street and is inspired by similar parks installed overseas in New York, San Francisco and London. The park stretches from Canterbury St to Murray St and includes large planters, synthetic turf, tables, chairs and umbrellas to allow people to come together, relax and take part in village life. “You don’t need an excuse to join in the fun, just drop by for a coffee, read a book, have lunch or catch up with friends before a movie,” said Cr Zakharov. Traders, community groups and locals will be given the opportunity to help bring the new park to life by holding events or art installations in the space. “A huge chunk of the kudos belongs with the local traders and community in Yarraville. It is a very unique place with a positive and supportive community. Local traders adjacent to the park are responsible for the set out and storage of the portable furniture each day. Without their support the project wouldn’t be successful.” said Amelia Longhurst from Maribyrnong City Council. Around $50,000 has been spent on setting up the park and all materials will be able to be reused in future parks following the completion of the project in April.